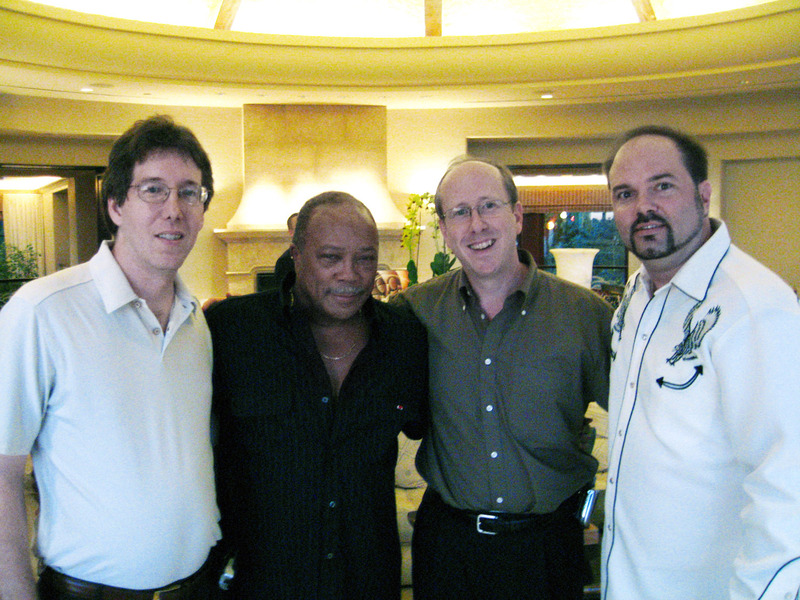 The partners of Reelin' In The Years (from left to right): David Peck, Quincy Jones (series spokesman), Phillip Galloway and Tom Gulotta. In October of this year, no less than eight new DVDs were released on the much-heralded JAZZ ICONS series, this latest edition bolstering its current catalogue to 23 titles. Since its inception in 2006, the series has been very well received in the marketplace, benefiting from good media coverage, effective advertising campaigns and a solid distribution network worldwide. The current crop of releases, like those preceding it, are all on-camera performances of jazz greats captured for posterity by different European television stations. For the most part in black and white, these valuable visual documents span a period of close to two decades, the earliest dating back to 1958, the most recent ones shot in the mid-seventies. This year's batch features, among others, masters like Sonny Rollins (one of the few 'Icons' still with us today), Bill Evans, Cannonball Adderley and the recently departed Canadian piano legend Oscar Peterson. For the second straight year, aficionados also have the option of purchasing all discs in a handsome box set that includes an exclusive bonus DVD with extra tracks not found on the remaining titles of this edition. In its short history, there is little doubt that this audio-visual anthology has set a very high standard (and certainly a welcome one at that), for the presentation of musical performances. Just by the packaging, it's clear that those responsible for this undertaking have a love for the music, but that together with a savvy business acumen have enabled them to make their product fly. Based in San Diego, California, Reelin' in the Years, is a company of fairly recent vintage whose original purpose was not to produce films on its own, but based on its current successes, it has definitely found another raison d'être. In a recent phone conversation, Tom Gulotta, one of the company's main partners, offers some insight into the company's most ambitious artistic and business venture to date, first by giving some background on the business itself and its involvement in the series, then assessing the current state of affairs and, finally, by throwing out a couple of teasers concerning some of its upcoming releases. "The way we started the Jazz Icons Series is that TDK first approached us about making a series of jazz DVDs, but we were a little skeptical at first, because they wanted us to produce these. More importantly, we would only commit to such a project if they were done the right way. You see, we've looked at a lot of jazz DVDs on the market, and we were not really interested in putting our name on a sub-standard product. Basically, the quality of what's out there leaves something to be desired, so we thought. To do things right means having everything done above board, like getting the clearances from all parties involved, the artists, or their estates (including the sidemen), the music publishers and what not. But we also wanted to put together quality packages with good artwork and informative booklets, too. All this would cost money, of course, and we told TDK that it would be an expensive proposition, but they agreed to our terms, and very much to our surprise I should add." "Reelin' in the Years Productions started in the mid-nineties. 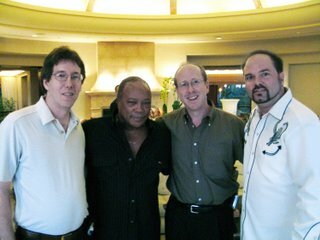 David Peck, my partner, actually founded it, and gradually built up his team in the ensuing years. I came aboard around five years ago. Our main business is acting as a representative for television stations around the world, and we serve as mediators between them and any interested parties requiring film footage for their productions, like documentaries. We are but one company in this field, though we are now one of the most prominent ones in this area. Our main business is what we call clip sales, which means negotiating fees for use of film clips of artists in documentaries. Then we got into the business of actually producing our own DVDs about five years ago, and we now have about 40 titles in our catalogue, above and beyond the Jazz Icon series. Just in passing, we are pretty confident that there will be another set of Jazz Icon releases in 2009 in spite of the tough economic situation we are facing these days." "When the first series came out two years ago, we were really thrilled by the response. But we insisted from the very beginning that both TDK and its American distributor, Naxos, take care of the advertising. We were adamant about having this product exposed to the right people, because we knew there was an untapped market out there; in fact, no one was really buying into it up until that time, because jazz DVD sales were very soft, even ugly, something in the order of a couple of thousand of copies and not much more. But we knew there was a potential market out there, and that there were more people who'd be really interested in this, if only it were done correctly, which meant better production values and proper media exposure through reviews and advertising. Both of those companies did their work, and they too were pleasantly surprised at the sales that came out of it. In fact, TDK made its money back in the very first year at that, and believe me, they laid out quite a lot." "It's quite an involved process to produce one of these titles, because you have to negotiate with several parties: the artists, or their estates in many cases, the television stations, the music publishers, and as mentioned before, we even give due financial consideration to the sidemen, not just the leaders. As you can see, there are a lot of people who are getting paid here. In fact, when you look at this on paper, it doesn't really look very attractive for a company to invest this kind of money, and that is why it hasn't been done before, simply because people were too afraid to loose money in doing it this way. But we said to TDK to just trust us in creating a superior product that would get people not only excited about it, but having them want more of it. And happily, we were correct." "On the average, I can say we have moved from about fifteen to twenty-five thousand copies from the first two editions, depending on the title. The John Coltrane, for instance, has certainly sold more than, say, the Louis Armstrong. As for the box sets, their numbers kind of level everything back a bit, but these are pretty popular as well." "Well, we can talk about this a bit, but we have not approached any of the artists, so I cannot go into any specific names for the time being. At this time, we are now looking into some footage from England from a mid-sixties TV series called 'Jazz from Studio 65'. For us, this is really the first time that we are engaged in a serious project with this broadcaster who, how should I say, has finally come around. Up until now, we have had good cooperation with other European TV stations, Belgium and Holland in particular, but then there are others that have great audio-visual archives who are just horrible to deal with, most notably France. It's ridiculous. They have theses beautiful films that will literally rot away on the shelves before anybody sees them, because they want so much money for them. Here in America, there is some stuff, but most of it has already been made available, like the Jazz Casual series from the early sixties. The problem in our country was that there were so few complete jazz performance shows on American television back then, and some of these are now lost, as they were either erased or just thrown away. Jazz artists rarely did full TV programs, but played maybe one or two songs on a variety show. When you look at our series, we go for complete, or extended jazz performances. And that's why the Europeans have to be admired, because they treasure jazz a lot more than the Americans do." "True, we have found a lot of footage by searching YouTube, but it is a two-edged sword for us. On the one hand, it is a great research tool to find out what is out there, but it's competition as well. I have a feeling a lot of people would say that 'I can just see that on YouTube' for free. In fact, this has lead us on occasion to ask some people to please take down something they have posted on it, like a whole song or a complete performance, it's just a matter of fairness. If it happens to coincide with footage that we represent and want to use in an upcoming title, then we ask them to take it down. Mind you, it doesn't bother us if there is only a clip posted, as long as there is reference to our commercially issued product." "It goes without saying that we have plenty of things in our possession we'd like to put out. For instance, a lot of people ask us why we haven't issued a Miles Davis title yet. Well, it has to do with Sony, since they claim the rights to his music of the sixties. Happily, I can say that we do have at least two great Miles Davis television concerts (one from Stockholm in 1967) and we are planning the release of a DVD that should appear in the coming year. We will be the main producer of this title, so as to maintain the quality and values of our series, but at this time it appears more likely that Sony will issue it rather than ourselves." "The good response we have had is no fluke; it is the result of all parties doing their work properly in order to get the product out in the marketplace and to make it known through reviews and advertisements. All of our efforts have paid off, too, because people have responded to it and have become loyal to the brand. For those who have already purchased titles from the first two editions, they know by now they can go for more in our newest set. If they see our Sonny Rollins on the shelf, just to take one example, they know it will be great, so they'll pick it up without having to think twice about it." Interview based on a transcript of a phone conversation recorded on November 11th, 2008.